During the collections process, you come to some significant stopping points where unresolved matters take a turn for the worse. It’s important for you to know when you’ve reached these points, how important they are, and what comes next. Understanding how these actions work and what you can do about them may save you credit score points and money in the long run. So what is a charge-off? When a collector or creditor charges off your account, its accountants, regulators, or audit firm have decided that your debt is very unlikely to be collected, so they don’t allow it to remain on the books as an asset. For accounting and tax purposes, the creditor considers your account a loss, and your account is charged off the company’s books. If you pay a bill after its due date, it’s technically late. Paying up to 30 days late is usually no big deal. After you get to 60 days late, you may face some fees and maybe an interest-rate increase. Being 90 days late can cost you more and often brings on the serious players in the collection department. If your account is between 120 and 180 days past due, your debt enters a new phase known as the charge-off. A creditor charging off a debt in no way means that the debt is canceled, nor does any interest associated with the account stop accruing. No one is happy about this turn of events, and among those who should be the least happy is you. Why? Because you still owe the bill while fees and interest continue to accrue and your credit damage grows. A debt charges off when it gets so old (typically 180 days past due) that its value is called into question (as is your sincerity in promising to pay it). If your creditor reports account histories to the credit bureaus, and most major ones do, the charge-off is considered a very serious negative. When a debt charges off, you still owe it, and the creditor or collector will still attempt to collect it. The charge-off means only that the creditor no longer counts the debt as an asset. An unpaid charge-off causes more damage to your credit report than a paid one. 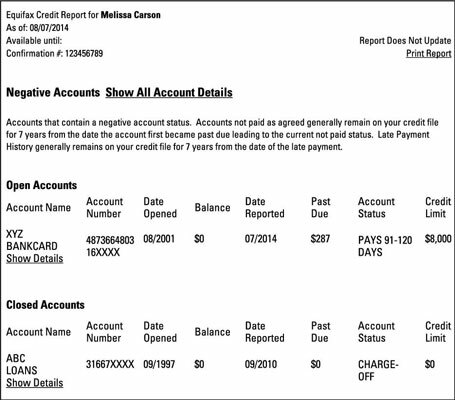 Until you pay what you owe, the debt is labeled an unpaid charge-off on your credit report. When an account first charges off, you may experience a lull in collection attempts. The reason is that the debt is probably changing hands from the collectors who were unsuccessful trying to save the account to those who want to save at least some part of it. The most experienced collectors typically deal with charge-offs. These collectors have heard it all a thousand times before and have lasted in this business because they’re efficient and effective. Make no mistake, collectors will try to collect the money due; however, after they determine that you won’t pay, your account may be sold many times for decreasing amounts to increasingly aggressive collectors whom you really don’t want to deal with. Collectors try to make you promise to pay your debt in full or in a series of agreed-upon payments. They take promises very seriously, so you don’t want to make and then break one. Make sure you know for sure how much you can afford to pay monthly or in a lump-sum amount before you make any promises. The best way to do so is to prepare a budget that takes into account all your income and expenses. Using this spending plan, you can identify areas to trim so that you can put more money toward paying off your debt. Without a plan, you’ll only be guessing. Cut out or decrease as many of the expenses as you can. Increase your income if possible. Repeat this process until you have enough money to pay the bill in a reasonable amount of time. Don’t promise more than your plan says you can afford. Be sincere, explain how you arrived at your payment amount, and request that the collector send you a written agreement for this amount. When you receive the agreement, send the payment on time, every time. You can ask for a reduction in fees when you negotiate the payment agreement, but a reduction in the amount owed is harder to get. A delinquent debt that hasn’t reached charge-off status and is paid becomes current on your credit report, but a charge-off never does. An unpaid charge-off becomes a paid charge-off. A paid charge-off is much better for your credit than an unpaid charge-off because it indicates that you had a problem — perhaps a serious one — but that you eventually paid the bill. Hallelujah! Now you can get a little boost on your credit report and you’re on the way to obtaining credit at a more reasonable rate. Why? Simple: You’ve established that, although you may be a high-risk borrower, you do pay your bills in the end.